It's rare that a show conjures up such genuine joy and elation as the Choir of Man, playing at the Sydney Opera House. From the free beers given out pre show, to the hilarious audience participation segments, this cabaret feels more pub concert than musical theatre. The premise is simple. A group of men gather in a pub in England where their friendship is linked together by their choir. Over the course of the night, they share their feelings and emotions, unafraid to break down the barriers of toxic masculinity to support and care for each other. 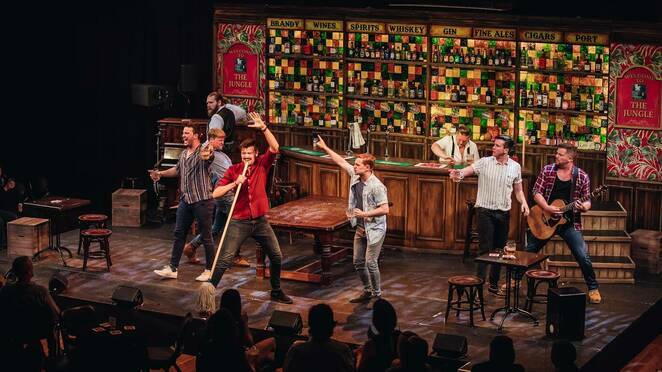 The atmosphere of the show is utterly electric from the start, with the cast positioned amongst the audience pre-show and eager audience members lining up on stage to grab a free beer from the show's bartender. 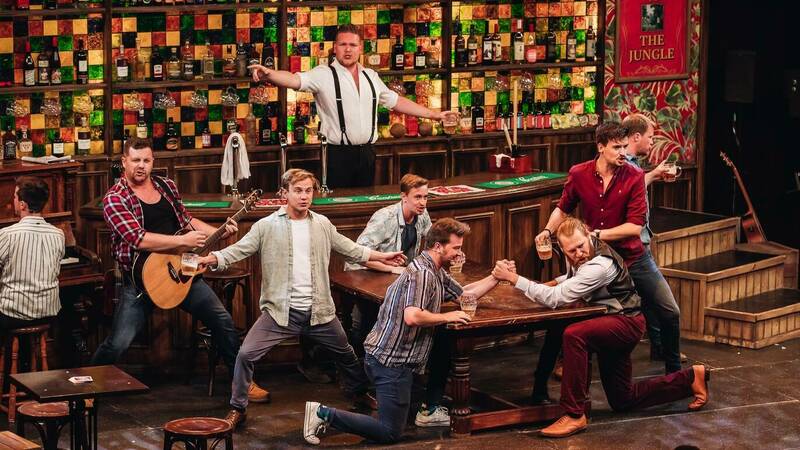 When the performance starts, George Bray sensitively narrates a nostalgic inside look at the English pub culture, paying homage to the people and places that have become our drinking houses over the years and the friends we have found there. The show features a multi-talented cast of men who can not only sing, but also play a variety of instruments and a couple even tap dance! They tackle some massive numbers, such as 'The Impossible Dream', Adele's 'Hello', Sia's 'Chandelier' and a rousing, standing-ovation-worthy rendition of John Farnham's 'You're The Voice'. The performers execute their vocals with such precision and manage to maintain such an incredible energy throughout the show that it feels like the experience flies by. Particularly brilliant is the full-cast rendition of 'Escape (The Pina Colada Song)' and the excellent performance of Queen's 'Somebody to Love'. The staging of 'The Impossible Dream', which a velvety voiced Richard Lock sings intently whilst attempting to create a card house from beer coasters is also very very funny. This is a show that at once offers a rocking good time and a look at the more vulnerable side of men who are not afraid to talk about their feelings or cry when they feel the need. It's subtly done, but the breaking down of the notion of emotions as weakness is effective. The Choir of Man has had hugely successful seasons worldwide, with this Sydney Opera House season the latest in their Australian tour with Canberra to follow. Do what you can to score yourself a ticket!